Greetings from the new Connecticut State Grange Public Relations Committee. As the former Publicity Committee morphs into the new Public Relations Committee, we look to continue traditions yet also look forward to positive change. Public relations is vital to the success of the Granges across Connecticut. A basic definition of public relations is “to shape and maintain the image of an organization or individual in the eyes of various publics.” What is a “public” exactly? A public, in PR terms, is anyone who ever has or ever will form an opinion about the organization or individual. Communication is essential to Grange success, both internally and externally. Favorable media exposure means recognition in the community, acknowledgement of Grange activities, services and accomplishments and a higher profile of your Grange among potential members. Internally, it will help build pride in membership that will grow a more successful Grange. Please welcome our team:  Co-Directors Terri Fassio of Winchester Grange and Robert Charbonneau of Meriden Grange; members Maggie Schofield of Cawasa Grange, Don Offinger of Cannon Grange, and Frank Forrest of Hillstown Grange. As the Connecticut State Grange Public Relations committee, we have an amazing opportunity before us to work with an outstanding group of dedicated Grange members, committees, directors and officers toward a common goal. Our mission going forward includes: the promotion of activities in the Grange utilizing different types of media, the introduction of information and material to Granges in Connecticut to aid them in creating informative news packets to the public, and to visit and encourage Granges to give our team feedback on what works and finding opportunities for improvement. We are also encouraging Grange members with computer experience to help your community Grange’s Public Relations Chairman. Our team is still getting our sea legs, but has diverse experience and will greatly enhance our ability to help Granges in Connecticut. Our hope is to build on successes from Carl Bernhardt’s Publicity Committee with existing contests and adding exciting contests for the new Grange year. Each Grange and Committee will be receiving a Public Relations Information Packet which is chock full of tips, tricks and tools to improve the communications skills of our Connecticut Granges. With a little advance preparation, each Grange can ensure that they are ready for any marketing or public relations opportunity that comes along. The cornerstone of the PR Information Packet is a Data-CD which has a broad range of templates, official Grange seals, clip art, and promotional material. This will aid in promotions, membership drives, and creating articles for local news outlets. A key item in the packet is the “Connecticut State Grange Public Relations Tool Kit” booklet. This will help your Grange get started with tips, samples and instructions on digital photography, press releases and announcements, and how to write a winning article. 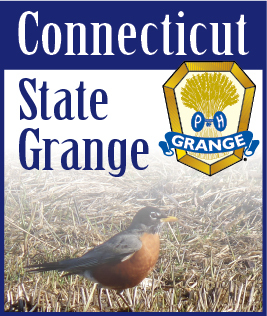 The booklet even contains a list of Connecticut media outlets, how and when to use the Grange seal, and background information about the Grange in Connecticut. As media technology evolves, so does the ability of the Connecticut State Grange to provide these tools directly to Grangers via the Internet. Many of the Public Relations tools can be downloaded from www.CTStateGrange.org. Additional packets are available upon request. Just drop us a line at: publicrelations@ctstategrange.org.